Heads up Tasmania we have two BIG prizes to be won! 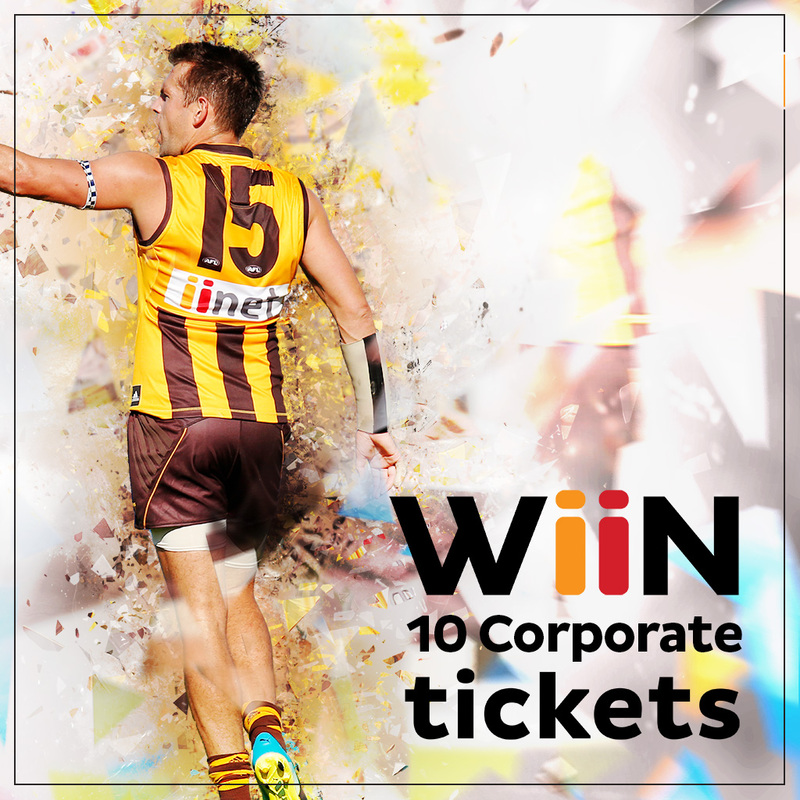 WIN 10 awesome Corporate seats for you and 9 mates at the 2017 Toyota AFL Premiership Season Hawks v GIANTS game at UTAS on July 8th! Don’t worry! If you don’t win, second place will receive reserved seating tickets for you and 9 mates to attend the game! To enter, on one of the competition posts tag the 9 mates you would take with you and tell us in 25 words or less why you should be at the game. 1.iiNet Limited (ACN 068 628 937) of Level 1, 502 Hay Street, Subiaco WA 6008 (“we” or “us”) are responsible for conducting the ‘Hawks Strong As One Competition’ (“the Competition”). 4.The Competition commences at 6:00AM AWST on 13th June 2017 and closes 11:59PM AWST 26th June 2017 (“Competition Period”). 5.Entry is open to Tasmanian residents aged 12 years or over at the date of entry. If you are under 18 years old, you need to obtain consent from your parent or guardian to enter and to provide your personal information to us. Employees (and their immediate family) of iiNet Limited, Hawthorn Football Club and the TPG Telecom Group are ineligible to enter. 6.To enter the Competition, tag the 9 friends you would take with you and tell us in 25 words or less why you should be at the game, on the iiNet Facebook, Twitter or Instagram pages during the Competition Period (“Entry”). 12.The Entry determined by us to be the most original and creative from the Entries submitted during the Competition Period (the “Winner”) will win First prize of 10 Corporate tickets to the 2017 Toyota AFL Premiership Season game between Hawks and Greater Western Sydney on the 8th July 2017 (“First Prize”). First Prize is valued at approximately AUD $3950 (incl GST). 13.The Entry determined by us to be the second most original and creative from the Entries submitted during the Competition Period (the “Runner Up Winner”) will win Second Prize of 10 Reserved tickets to the 2017 Toyota AFL Premiership Season game between Hawks and Greater Western Sydney on the 8th July 2017 (“Second Prize”). Second Prize is valued at approximately AUD $800 (incl GST). 15.Both Winners (Winner and Runner Up Winner) will be determined at Level 1, 502 Hay Street, Subiaco WA 6008 at 10am AWST 27th June 2017. 19.A total of 2 Prizes (First Prize and Second Prize) are available to be won. The total value of the prize pool is approximately AUD $4750 (incl GST). The Prize does not include any other expenses, such as costs to travel to the game.